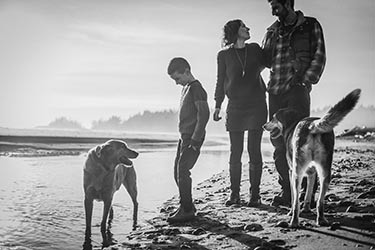 Let’s face it: the list of occasions for which you can hire a photographer has grown significantly in the past 20 years, and while some of them seem pretty obvious (weddings: heck yes! ), others don’t appeal to everyone (40th birthday splatter paint photo session anyone?). 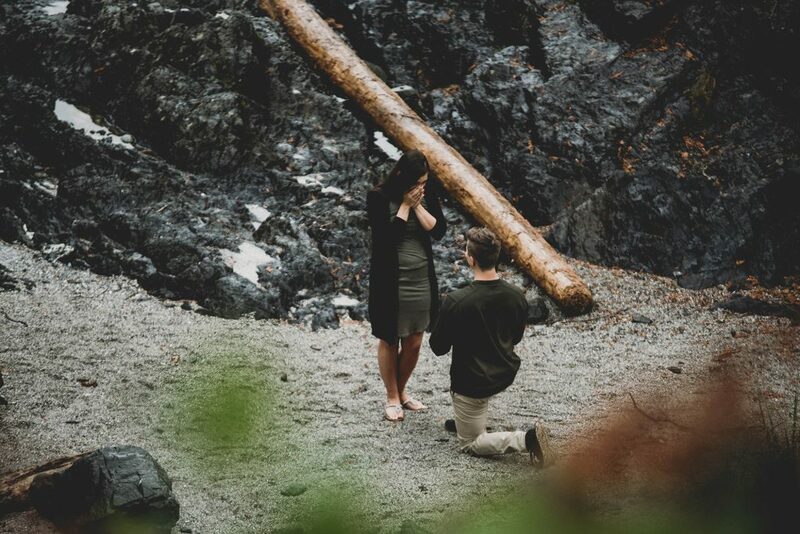 Proposal photography has been gaining traction recently, and despite those who would claim that it’s a passing trend embraced by a social-media-driven world, I think it’s here to stay. And that’s a really good thing. 1 .You put a ton of work into planning this. If you’re asking someone to marry you, you’ve probably been mulling it over for a while. You’ve probably thought about a bunch of aspects to your proposal: the time, the place, what you’ll say, how he or she will react. It’s a really special moment, and all that work shouldn’t just disappear. Having photos of the moment is the perfect memento for your perfect moment. 2. That reaction. You saw it – was it surprise? Joy? Did she exclaimed “are you kidding me?” Did it take him a second to really get what you just said? The reaction is the beauty of it – a person goes down on one knee, and it’s just priceless. This is a once-in-a-lifetime moment (even for a second or third or seventeenth marriage – believe me, it really is) and the reaction is something that is reserved for the very few truly special instances we have in life. 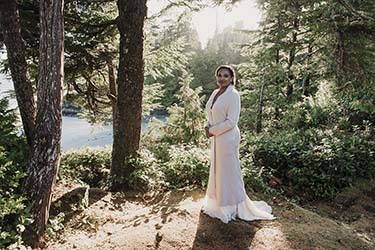 I asked my online community to weigh in on this, and I think Alison Dahlie of Compass Wedding Cafe said it best: “Because it is absolutely raw, true emotion.” During a wedding, all eyes are on the couple. Whether or not you intend it, the awareness that people are watching tempers a person’s reactions. During the proposal – surprise – guards are down; there’s no one to keep it together for (your photographer is hiding in the bushes!) and you’ll want to see that reaction again. 3. When it comes to heirlooms, that’s the real thing. A hundred years ago, photography was a luxury that many couldn’t afford. Most photography was confined to studios as equipment was cumbersome and finicky, relying on chemical processes, perfect timing and leaving little room for error. The photos we do have of our ancestors are that much more valuable to us for their rarity. When looking at old photos, we search faces for a hint of ourselves, hoping for a a glimpse into their lives. 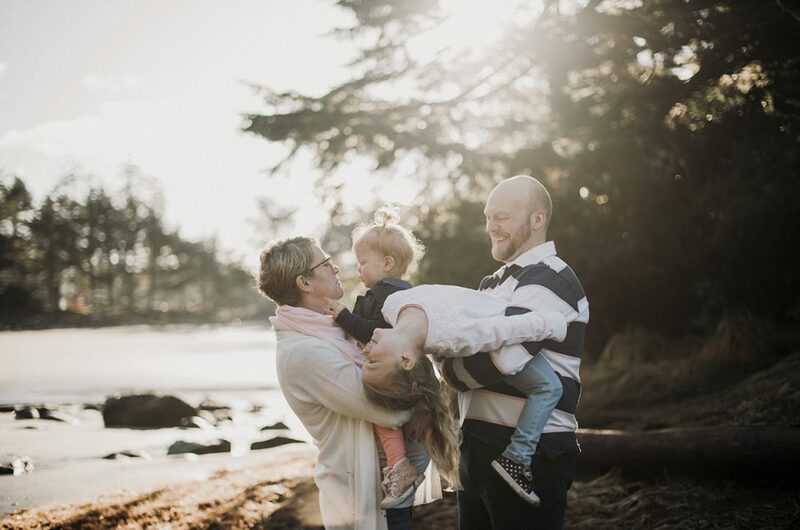 Imagine what your great grandchildren will feel when they can see the look on great grandma’s face when great grandpa took her hands in his, said “I love you and I’ve been thinking about this for a long time now. You’re the one I want to spend my life with” and then got down on one knee and pulled out a ring. two: even if you didn’t think of everything, your photographer can help. Timing. This is critical for so many reasons. If you’re proposing in February, your timing will need to be strongly based on tide charts, because at high tide, there’s pretty much no beach. 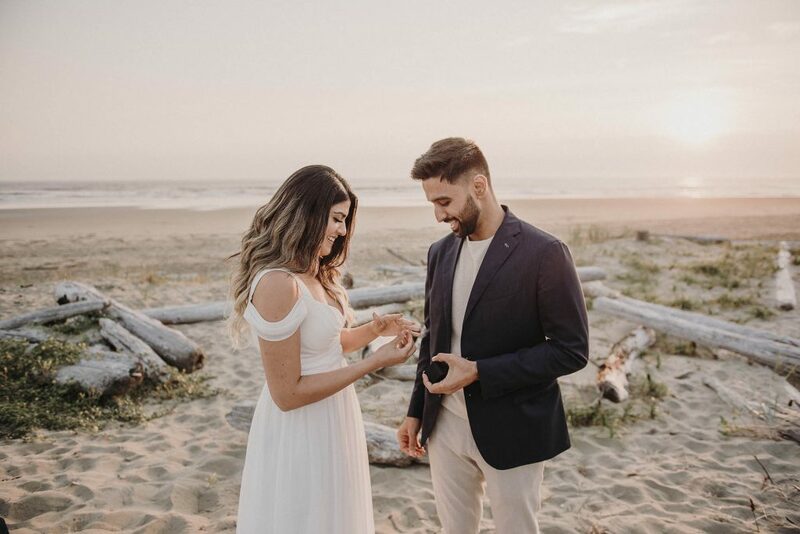 You need to also consider timing based on the sun – if you’re proposing before dinner (a popular choice) then you need to plan accordingly so that it’s not completely dark, but probably late enough in the day that she’s already dressed for dinner. Back-up plan. Sometimes the beaches are closed due to dangerous conditions. I (am extremely fortunate to) live here, so I get a bit more of a heads-up about things like beach closures and upcoming storms than most tourists (why would you want to worry about those things on vacation?). I’m your lady on the front lines, scouting out your location the morning before your proposal, making sure there is nothing that would restrict us from going through with your plan, and if there is a problem, I’ll have a back-up plan already in place so you don’t have to wing it. Privacy. Do you want an audience, or not? 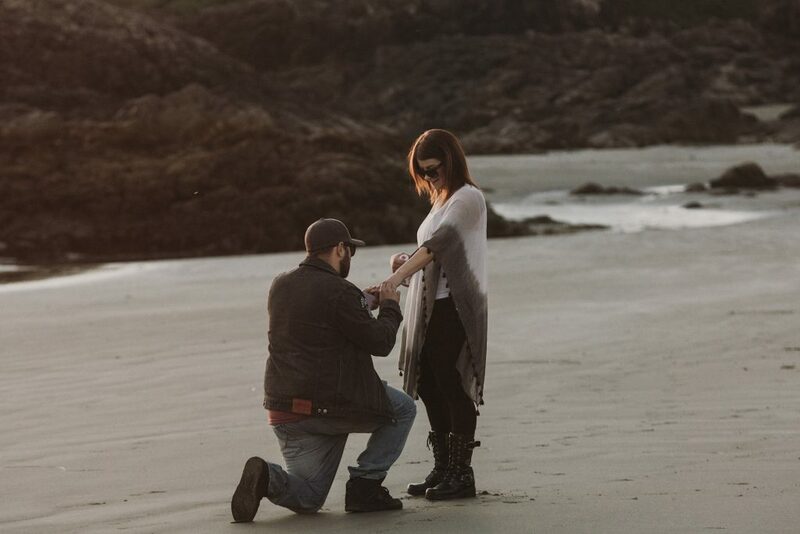 If your soon-to-be-fiance is a seriously private person, I might recommend that you propose at Brown’s Beach in Ucluelet rather than Cox Bay in Tofino. 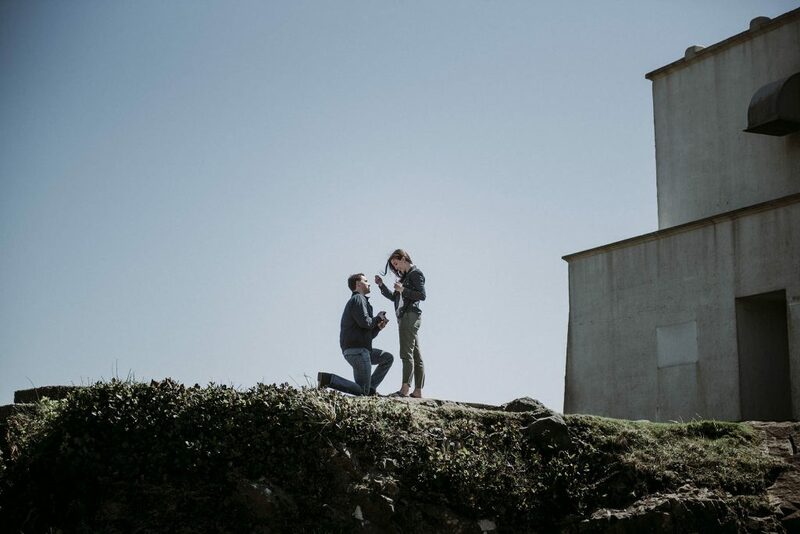 Both are AMAZING spots (and I’ve shot proposals at both), but at Cox you are never alone. Another advantage to having a photographer on your side: if you choose a more private location and there are people already there, I’ll be there 15 minutes ahead of you and will kindly and respectfully ask them to clear out so you can have your moment alone. The super-special. A note in a bottle? Flower petals and champagne? A flower arch on the beach? If you want to do something super special, you will need help. I can help with little stuff, or I can point you in the right direction for a grand gesture. 5. Sharing. Of course the last one is sharing. Everyone wants to see these photos. It’s big news. Share it! The full gallery of photos will take a week or two (depending on the season) to complete, but I’ll send you an announcement photo within a few hours so you can blast it to your friends and family. Best of luck with the love of your life. If you’re ready to plan something special, this is how you get in touch.